While the new iMac Pro is not end-user upgradeable, Apple component supplier, OWC, did a teardown of the latest iMac Pro base model and found that the RAM and SSD can actually be upgraded if needed. 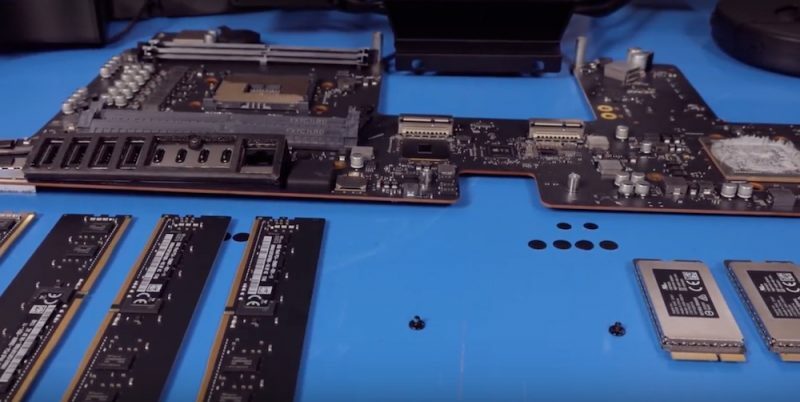 A third-party Apple component supplier, OWC, has created a video showing the teardown of Apple's latest iMac Pro. The teardown reveals interesting information about how Apple went about stuffing powerful internals in such a slim profile. The video shows that while most of the components are soldered, the RAM and SSD can be swapped out for upgrades. The teardown video shows that the 32 GB base model has four 8 GB DIMMs in a quad-channel configuration. Apparently, the RAM can only be configured in quad-channel, implying, if you're interesting in upgrading from a 32 GB to a 128 GB configuration, all four DIMMs must be replaced together. The video also shows the two 512 GB SSDs which are RAIDed to give 1 TB of storage. Luckily the SSDs are not soldered but replacing them requires careful removal of tamper-proof stickers. OWC could also take apart the heatsink-fan combo to reveal the CPU and the GPU. While the AMD Radeon Vega 56 GPU is soldered onto the motherboard, the custom Intel Xeon W 8-core CPU appears to be placed in the heatsink assembly with the help of thermal paste. Therefore, theoretically, the CPU should also be upgradeable. The standard iMacs do allow for upgrading the RAM after purchase via a small hatch at the back of the machine. The new iMac Pro, which is Apple's first pro-computer in a long time since the 'trashcan' Mac Pro, drew criticism for not having user-upgradeable components despite the 'Pro' moniker. While Apple stores and Authorized Service Providers can do the field upgrade, it limits the possibility of using third-party (and cheaper?) RAM and SSDs. OWC plans to offer such after-market upgrades as a service. The supplier is also looking to offer DIY upgrade kits for enthusiasts.